" BUY now ...DIE later " !! Back in 1984 , while I was on a Govt project in Qatar , it was specific to use non asbestoes roof sheets .Why it is to be non asbestoes instead of asbestoes which is commonly used , led me to find out that asbestos products which includes roof sheets is banned because of health hazards .This was a surprise news for me then . Hailing from a country where this is still being extensively used , I invite those readers who are not aware of this threat . Asbestoes kills! In 70 s it was found out that breathing in air containing asbestoes fibre can lead to diseases . Later it was confirmed that prolonged inhalation of asbestoes fibre can cause serious illness including cancers.Even a diseases is named as Asbestosis , which can be also a direct cause of ' Mesothelioma'- lung cancer !! Both workers in the related industry and consumers like any one of us of the products are at risk. 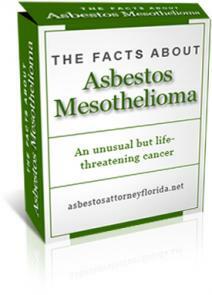 It may be noted that it may take 30 years or more for asbestoes related cancers to emerge ! It is interesting to note how the issue of asbestoes is handled in different countries. Australia stopped the mining of asbestoes in 1983 and phased out in 1989, banned entirely in 2003.Italy banned it in 1992. Japan in 2004.European Union has completely banned it .USA did the ban in 1980 s. Asbestoes is banned in 50 countries so far. It is banned by ILO ( International Labour Organisation ,WHO ( World Health Organisation) and WTO ( World Trade Organisation). In spite this many countries continue to use it , even increasing the rate of consumption many folds. 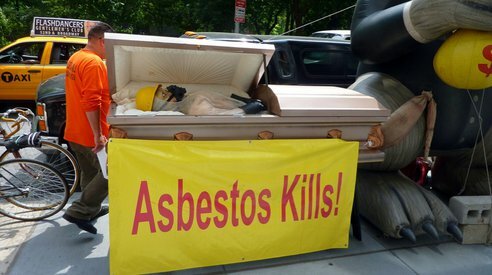 Canada , one of the largest producers of asbestoes , continues to produce it and export but enforced not to use it internally !! Number of people or organisations there are opposing the export as well .In fact it is their popular awareness slogan for the foreigner buyers of this dangerous material - Buy now..Die later - which I have used as the caption!! Russia , Brazil and China , the largest producers of asbestoes in the world continue to extract it , export and consume as well. Sadly , the commercial benefits which may run to millions may be influencing these countries of not banning asbestoes ...atleast so far. 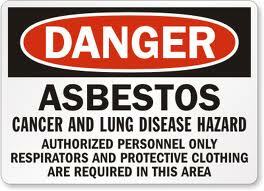 India is one of the countries where asbestoes is extensively used to this day . Unfortunately India 's commercial use grew 300% over last 30 years or so. India also has few mines in Rajastan and Andhra which contribute to 10 % of total consumption. Not less than 100,000 workers are in the manufacturing industries while consumers are countless ! BWI - Building and Wood workers International has warned in 2008 that India is on the verge of a devastating asbestoes cancer epidemic .The fact that it will take over 10-50 years for the cancers to be identified in individuals from date of exposure make this issue unnoticeable at the moment but soon or later will blast out when it will be too late to contain!! The least one can do is ensure that no products containing asbestoes to be used as a consumer . 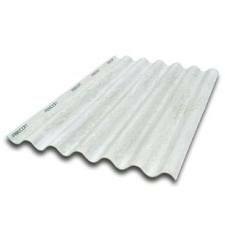 Never use AC roof sheets for the dwelling houses or for that matter not even for stables or petty work areas . Try to find out whether asbestoes is used while buying products such as brake pads , toys , electrical insulating materials , building materials such as floor tiles etc .This could be difficult for a lay man but let us start making efforts for it ..It is worth it. Never work in areas where asbestoes particles will be inhaled. Even in suspected work places use dust masks. Pass the message to friends, colleagues and relatives.......Make efforts of awareness among the dear and the near. World Trade Centre in USA was built before asbestoes restrictions were put in place there. As the twin towers collapsed in 9/11 , the authorities had to get rid of thousands of tons of steel scrap, possibly contaminated with asbestoes and other toxic risks . Do you know where it landed up? China and India!! It was exported !!! Probably that steel scrap after reprocessing might have been used by some of us in the form of spoons , utensils or other forms or even exported back to USA !!! !